Today I am tremendously pleased to present the guest post of fellow blogger Jennifer over at Kitchen Serf. Jennifer’s mission at Kitchen Serf is to share how she feeds her family while staying (mostly) out of the fast food drive through lanes and frozen food aisles. 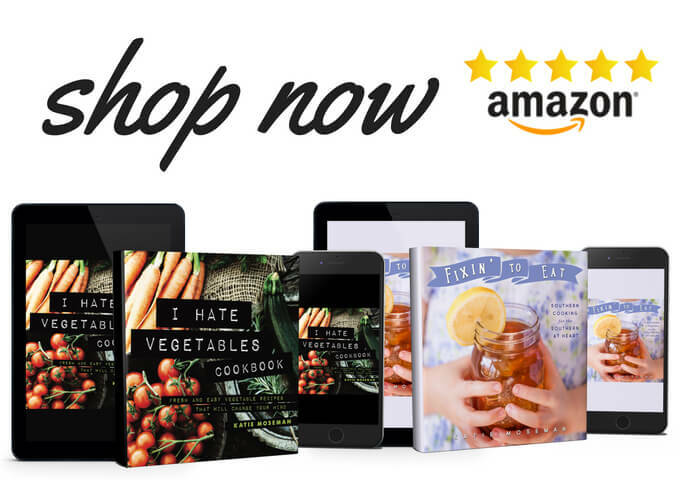 She shares tips, ideas and recipes for making cooking at home a lot easier and more delicious. When not cooking or surfing the Internet, Jennifer is taxi driver for her middle-school son, a newspaper reporter and manager of a flock of animals, including a Lab named Jesse, unproductive chickens and too many cats to mention. 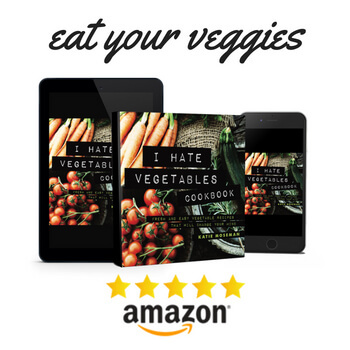 You owe it to yourself to check out her always interesting and often humorous blog! Hi! 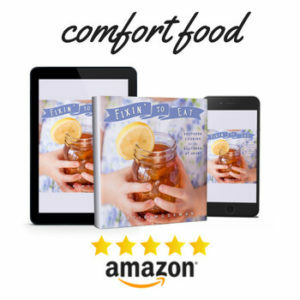 I’m Jennifer from Kitchen Serf and I want to thank Katie for the honor of guest posting on Recipe for Perfection. Truth be told, and please keep reading, I’m a diehard brownie mix girl. But, I do have a really good homemade brownie recipe in my arsenal called Triple Chocolate Brownies. That recipe was inspired from one by Brigette Shevy, who some of you may know as moneysavingmom.com‘s sister. What I really like about these brownies, besides all their triple chocolatey-ness, is that they develop a crinkly brownie top like box mix brownies do. I’ve been meaning to make salted caramel brownies for a while now because I am totally addicted to the salted caramel brownie cake pops at Starbucks. So, when Katie asked me to guest post I was very excited. 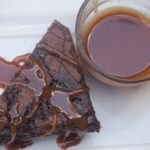 I knew the perfect recipe to share would be a smashup so to speak of Triple Chocolate Brownies with Homemade Salted Caramel Sauce. I don’t post as many fabulous desserts on my blog as Katie does but we do have a good time so I hope you’ll stop by and say hi! 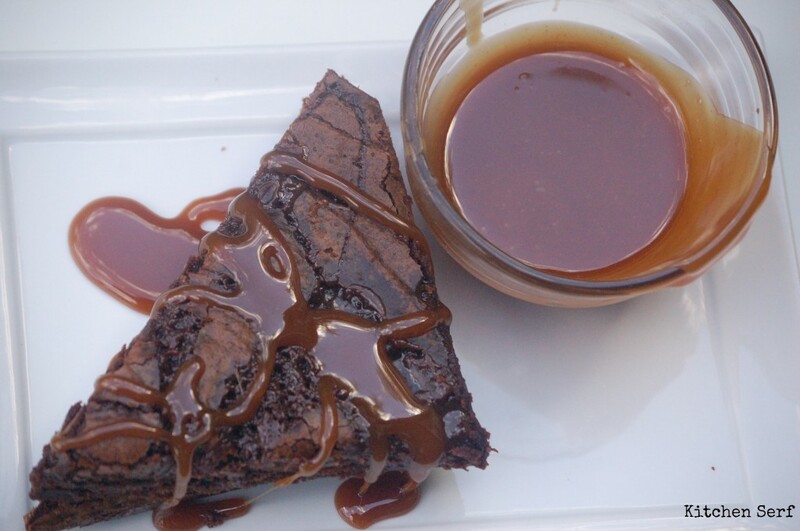 Fabulous triple chocolate brownies lavishly topped with homemade salted caramel sauce. In a large bowl, combine cocoa and baking soda. Blend in 1/3 cup melted butter. Add hot coffee and stir until well blended. Stir in sugar, eggs and the remaining 1/3 cup melted butter. Add flour, vanilla, and salt. Stir in chocolate chips. Pour into a greased 9×13 pan and bake at 350 for 40 to 45 minutes or until toothpick comes out of center of brownies somewhat clean. Let cool (for as long as possible) before slicing while you're making the caramel. Make sure you have everything measured and ready at your fingertips before you begin. Put sugar, water and corn syrup into a large heavy-bottom sauce pan. Bring to a boil while whisking constantly over medium to high heat until sugar has dissolved. Just when you think something has gone wrong the liquid will turn a lovely amber hue, keep whisking away. In a few more seconds, the liquid will turn from amber to caramel, at which point you immediately turn down the heat all the way down but not off. On my stove, this took 10 minutes. Pour in the cream carefully. The mixture will bubble up so you'll want to stand back. Immediately add the vanilla extract and salt. Whisk until the mixture has combined. Allow to come back to a boil for just one more minute. Alert: during the 10 minute whisking stage or however long it takes, do not stop stirring, do not take your eyes off the sauce. Don't answer the phone. A moment of inattention can ruin the sauce. Be careful. There's no burn like a sugar burn. Carefully pour caramel into glass measuring cup. You should have about a half cup. Pour caramel over brownies and enjoy. Serve any remaining caramel sauce with sliced fruit, pretzels, chips or your fingers. Could you just go to Trader Joe's and buy a jar of fleur de sel caramel sauce for this recipe? Sure. I'm all for convenience. But, there is nothing like the taste of homemade caramel so at least once, promise me, you'll make it from scratch. Yummy! Delicious brownies! Keep up the good work! love that these get the crinkly top like box brownie mixes! And salted caramel is just the icing on the cake! Yum! The only thing better than salted caramel is…. Nothing! Thanks for sharing this gorgeous recipe Katie! Big fan! I love this recipe, but most of all, I love the directions for making the salted caramel sauce. As one who is all too prone to becoming momentarily inattentive, I can attest that watching caramel sauce like a hawk is essential. Advising us to do with good humor is the best way to tattoo this on my brain too! I’m a brownie mix girl too and I love salted caramel! These brownies look great.